Zeus. King of the Gods. Father of Gods and Men. The Gracious. The Just. The Lawful. Protector of the Home. Guardian of Strangers. Averter of Evil. In the modern Pagan movement, the God is rarely acknowledged. If he is, it is only as consort to the Goddess. Those polytheists that do acknowledge a Chief God tend to only pay him lip service. Yet Zeus was honored across the classical world from the slopes of Mount Olympus to the banks of the Nile and beyond. He was born and raised on Gaia and only later became King of the Gods through his own courage and wisdom. Zeus is more than an authority figure. He is more than a lusty philanderer. He is a god worthy of love and honor. This unique collection is a living testament as to who Zeus is to his modern worshipers. This anthology of scholarly essays, deeply personal reminiscences, rich poetry, and short fiction will challenge all of your preconceived notions about this ancient God. It will open your eyes to a God who is awe-inspiring yet also approachable. You will come away with a new appreciation of Zeus as king, husband, lover, father, judge and protector. Come out of the dark and see Zeus in a whole new light. 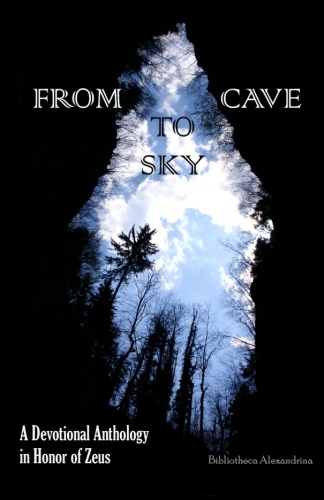 From Cave to Sky is available in paperback through Amazon or at Amazon.co.uk here, ebook format for the Kindle, and at Barnes and Noble. All of the proceeds from From Cave to Sky – as well as many of the other volumes in the Bibliotheca Alexandrina series – will be used to help promote the revival of the worship of the Greek and Egyptian Gods, with a portion of the proceeds given to a worthy charitable organization in their name. So, not only will you be getting a wonderful book about the modern worship of Zeus – but your money will be going to do good work and help the revival of ancient polytheistic religions. ATTENTION Librarians, Teachers and Retailers: From Cave to Sky is also available at reduced cost for academic institutions, lending libraries (public and private) and retailers. Check our online store, or email baeditor@gmail.com with any questions. Read the review on Amazon. ATTENTION BOOKSELLERS: If you would like to carry From Cave to Sky in your store please contact us. We are willing to sell you copies of the book at a significant discount in order to make it easier to distribute From Cave to Sky as widely as possible. Please direct any inquiries to baeditor@gmail.com for more details. Read the Patheos interview with editor Melia Suez!